Money is a useful commodity in terms of paying bills and general lifestyle. But money can offer even more than that. 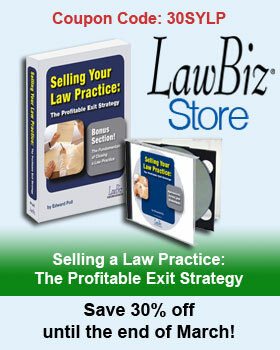 As a lawyer, you will reach times in your practice when it is appropriate to raise your fees. Of course, any time that you raise your fees, you risk losing some clients. But the time is right to raise your fees when the loss of clients is offset by new, higher-paying clients so that, overall, you will experience an increase in income. To replace defecting clients, you can’t take on new clients at the new, higher rate, which raises your average revenue per client. In reality, of course, a combination of all four opportunities will come into play to forever change your practice. The bottom line is, like water flowing to fill a hole in the sand, a temporary loss in the total number of clients will soon re-stabilize. And it will do so at a higher level of income. Your economic situation will improve, your client quality will increase, and the nature of the matters before you will become more interesting and challenging.